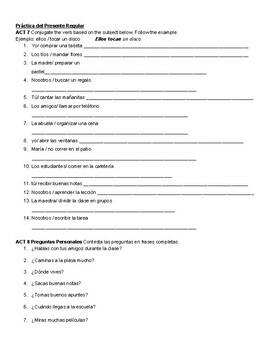 This packet reviews introduction and description vocabulary, the regular presente, presente progresivo, ser and estar, and common irregular verbs in the presente (tener, decir, hacer, ir). 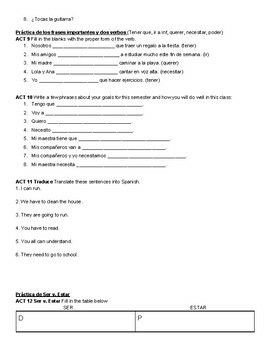 10 pages of practice, writing exercises, and grammar drills. 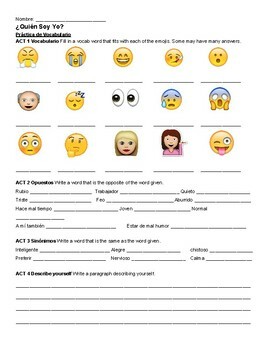 I use this packet in my classroom as warm-up activities, homework, and in class practice. Conveniently all placed in one packet, but activities can be pulled apart and used individually. Appropriate for Spanish levels 1 and 2.